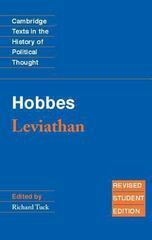 Hobbes 2 Edition Hobbes' Leviathan is arguably the greatest piece of political philosophy written in the English language. Since its first publication, Richard Tuck's edition of Leviathan has been recognized as the single most accurate and authoritative text, and for this revised edition Professor Tuck has provided a much-amplified and expanded introduction. Other vital study aids include an extensive guide to further reading, a note on textual matters, a chronology of important events and brief biographies of important persons mentioned in Hobbes' text.